Dr Matt O'Leary was a key speaker at prestigious international conference on teaching and learning in Mexico. 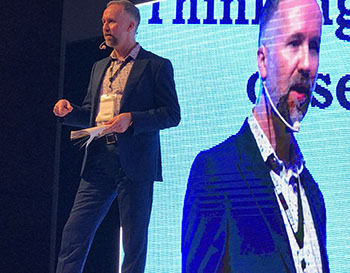 Dr Matt O'Leary, Reader in Education at Birmingham City University’s School of Education, spoke at the BBELT: Teaching outside the box conference. The conference took place from Friday 9 until Saturday 10 February in Mexico City. BBELT is an academic forum designed to introduce the latest trends and new ideas in English Language Teaching (ELT). The conference gives attendees the opportunity to participate in presentations, workshops and demonstrations of the best teaching material available. It also provides a space for discussion and learning development for experts about ELT in Mexico, bringing together outstanding teaching specialists from the UK, Mexico and the world. The conference brings together education experts and English language teaching specialists from around the world to discuss best practice in teaching, learning and policy making and implementation. Matt delivered a talk to delegates about his research findings and the projects that he has been working on at the University, and also lead workshops. It was an honour to be asked to present at BBELT, which is one of the most prestigious and respected academic events for teachers in Mexico. This was a fantastic opportunity to speak to a large audience of expert academics about my research findings and project work and also put across important messages I feel teachers need to take on board in order to have an effect on their students learning. This is the most inspiring and exciting conference I have ever presented at and I was overwhelmed by the warmth, affection and interest of the delegates’ who attended the talk. The opportunity for Matt to present at the conference came following his past year’s research. Matt’s talk – ‘Thinking outside the assessment box: using classroom observation to improve teaching and learning’ – drew on his ongoing research into the use of observation in the English education system, particularly his recent HEFCE-funded project‘Improving learning and teaching through collaborative observation’, which he has been working on with Dr Vanessa Cui and other colleagues and students from the University’s Faculty of Health, Education and Life Sciences. This year’s event was attended by over 1,300 delegates which included Senior Government Ministers from the Mexican Ministry of Education, the Director General of the British Council in Mexico and teachers and academics from all over Mexico.